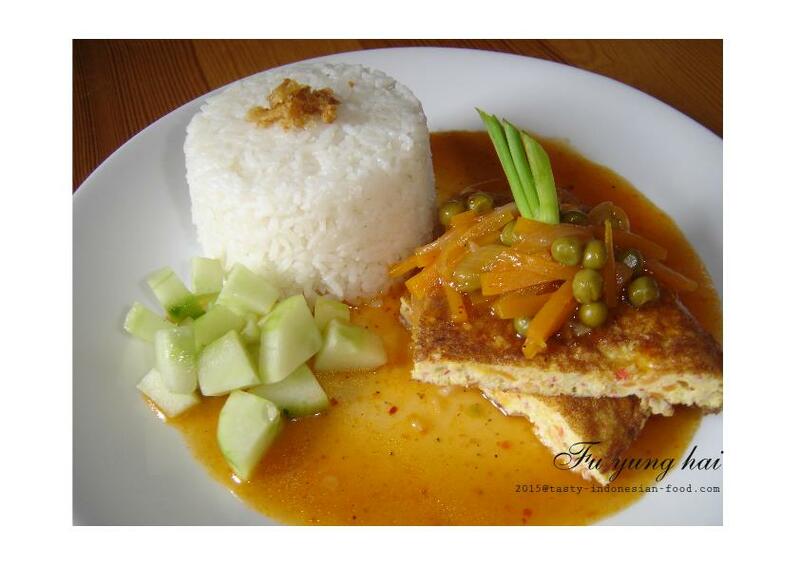 Fu yung hai is very popular Chinese Indonesian cuisine in which in Chinese known as Egg foo young. Literally meaning “lotus egg’, it made from eggs and often minced ham and with various vegetables as bean sprout, bamboo shoots, cabbage, spring onions, mushroom and water chestnut. They also add meat as roast pork, shrimp, chicken, beef or lobster. Despite is very popular in Indonesia as street-food (means you can easily find it in Chinese food seller along the street), Fu yung hai is very simple to make. In Indonesian cuisine, the omelette is usually made with minced chicken, prawn or crab and add carrot. The dish is served in sweet and sour sauce with peas and carrot. 1. Saute onion for few minutes then add the meat, carrots and garlic, simmer for 2-3 minutes. Remove from the heat. 2. In a bowl, mix the meat mixture with eggs, scallion, add salt and pepper. Whisk them well. 3. Heat oil in a wok/frying pan. Pour the egg mixture and cook until set and golden brown. Flip to cook the other side. 4. Make the sauce : saute the onion and garlic for few minutes, add carrot then pour the chicken stock/water. Add sugar and salt, continue cooking until it’s boiling then give tomato sauce and vinegar. Stir a bit so that the sauce will mix well before adding the peas. Continue cooking for few minutes. In the end, pour the mixture of tapioca flour. Stir for a minutes then remove from the heat. 5. Cut the egg as you wish, transfer to a serving plate. Serve immediately with the sauce and warm steamed rice. You can add cucumber pickles as condiment.